1JZ-GTE Bottom End Engine Parts | Bearings | Rods | Pistons - ** We try to keep one built short-block in stock at all times! ** Built 2JZ Shortblock 1000HP+ Rated (depending upon rod choice) - Select Your Compression! Why spend an extra $1,000-$3,000 more for a built short block, when we offer the exact same components (lets face it, everyone uses the same components) and many of the same machine shops everyone uses? Truth be told, not a single major Supra parts business has its own machine shop tools. Not one, us included. What we do have are machine shops (2) that have been machining 2JZ motors for years, so once we understand the application of the engine (race only, fast street car, etc), then we machine the block with the tolerances required. We assemble and meticulously build each motor in-house. All our tolerances are checked and then double-checked. Crank has already been confirmed rotationally during high-speed final balancing. Pistons weighed, rods weighed. We cannot describe everything we do in a simple listing, but suffice it to say, it's a comprehensive build. Rings are hand filed, and all torque settings done using SnapOn instruments kept in spec. You end up with a professionally assembled engine ready for install. 2JZGTE/2JZGE engines that have been prepped for power with forged pistons, ARP hardware, micro-polished and chamfered OEM crankshafts, machined using state-of-the-art equipment, and custom 2JZGTE specific billet torque plates are what our customers demand. We can do 1JZs, too! On top of this, Supra owners want to make sure the engines are proven, cost-effective (budget minded) and available for quick turn around times. Your wish is our desire. The SupraStore.com Stage 1+ race prepped 2JZGTE shortblock starts complete at well under $5000! We start with a thoroughly inspected 2JZGTE bottom end, which is inspected and cleaned, prior to being selected for fitment of quality components. The engines are then machined using a custom built billet torque plate (we have our own torque plates), so the engine stays "square and true" during machine work and prep for new forged pistons. Why we use a torque plate is explained in this video (same holds true for our setups, if not more so). Each cylinder is hand-fitted for each individual piston. 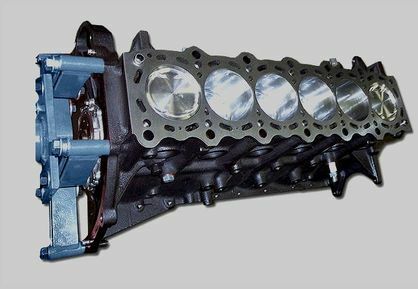 Setting ring tolerances is part of many various quality control and assurance steps in assembling your JZ engine. ARP main studs are fitted and the crankshaft is fully serviced for best performance and oil retention. The final rotating assembly uses custom forged rods with ARP hardware (1000HP+ proven), and bearings are rotationally balanced for vibration free operation and minimization of oil starvation. One of the latest trends in the 2JZ world (or boosted world in general) is E85 fuel and higher compression engines. We can provide any compression ratio desired, but have found 10:1 and 10.5:1 ratios to be the most popular. Piston price goes up when selecting compression ratios above 8.5:1, simply because of economics of manufacturing volumes. All the major piston builders build hundreds of stock compression pistons, so the cost is lower. High compression pistons are custom ordered. For higher compression pistons, please allow an extra few weeks on your build. Build time for standard compression pistons is only 3 weeks and 6 weeks for custom compression, so plan your project accordingly. Piston to Cylinder Wall Clearance .0045"
Piston Top Ring Gap Set to .024"
Piston Lower Ring Gap Set to .019"
* If you are providing a 2JZGE motor, which will be used in a boosted application, please note that because there is no "oil-squirter" design in the non-turbo motor, that we will provide boost compliant forged pistons specific to this application. HP rating of 1000HP is based upon using race fuel, good tuning, and RPM limit of 8,700 rpm. Additional power handling is available with other rod choices. After ordering, please telephone or email regarding shipping. Shipping and crating are additional, and the shipping calculator is not always accurate. Typically including crating, the cost in the lower 48 States is ~$265. We will always quote final ship to price. International shipping is always an estimate and will be final quoted at time of order. Please note that if you are "not supplying" an engine for us to build, then you can purchase the engine outright from us (select in drop down menu) using a seasoned block or a new OEM Toyota shortblock. If doing a built head or block there will be a core charge assessed until your core is returned. If your core is sent in advance, no core charge applies. If you prefer to purchase a core outright, we're happy to oblige and use only factory new OEM Toyota cores. Please inquire via email or our 800# on core exchange.